One week after my epiphany about how to increase my studio’s counter space and the renovation is complete. It definitely started out ugly and there were a couple moments where I’m sure my family heard me swearing in my little room (what’s new? ), but it was definitely worth it. 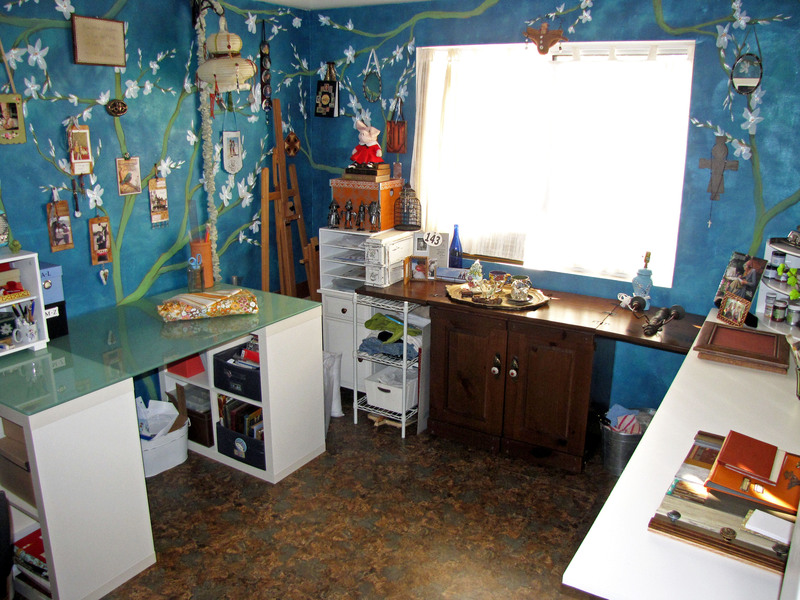 I was able to add over 7 feet of counter space along with more storage both on the main floor and in the closet. I should probably say something about the walls and ceiling before we get started. I did these back in 2009. The ceiling finish is made from Anagalypta wallpaper painted with Modern Masters Iron Paint, then rusted, then covered here and there with a plaster that peels up. 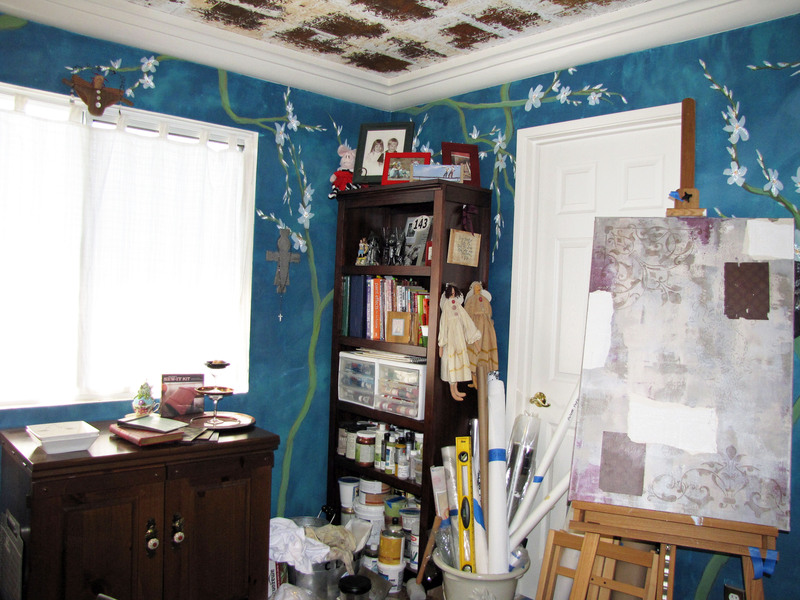 The effect is that I have an old tin ceiling that the paint has peeled off and the tin has rusted. 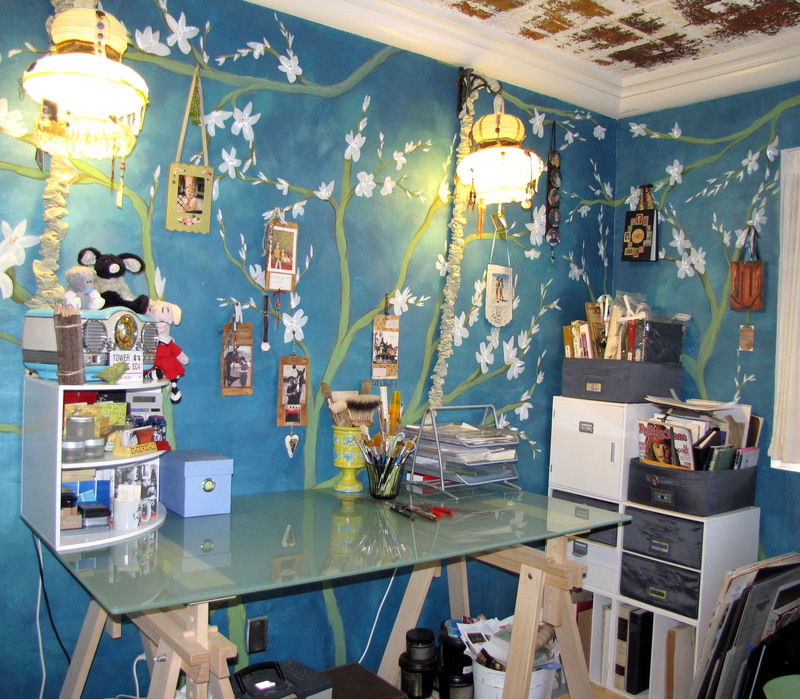 The walls were inspired by Van Gogh’s painting of almond tree blossoms and were created with Faux Effects Lusterstone. Several colors were trowelled on then I hand painted the trees adding Golden’s Glass Bead Gel into the centers of the flowers. I still love it, so none of that was touched during the remodel. This is what my only counter space looked like when I got started. I love the glass top because I can always scrape paint off so it’s always clean. The only thing IKEA offers for this top is sawhorses which I thought were cool but have since figured out that they take up a lot of space and have no storage. I went back to IKEA and bought these two Expedit bases at $40 a piece. I’m loving that the bases feel a lot sturdier. They have so much storage space that I haven’t even filled up the back cubbies. 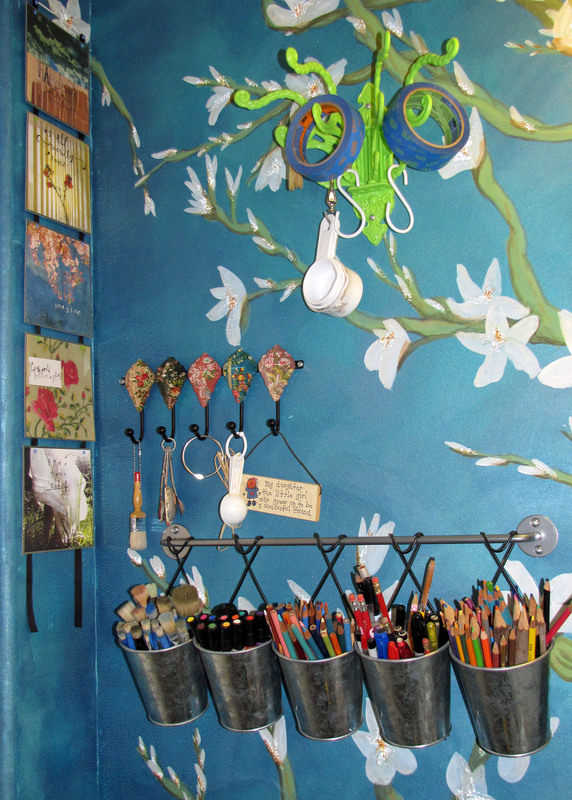 I decided to make this area a mixed media station with all those items in one place. 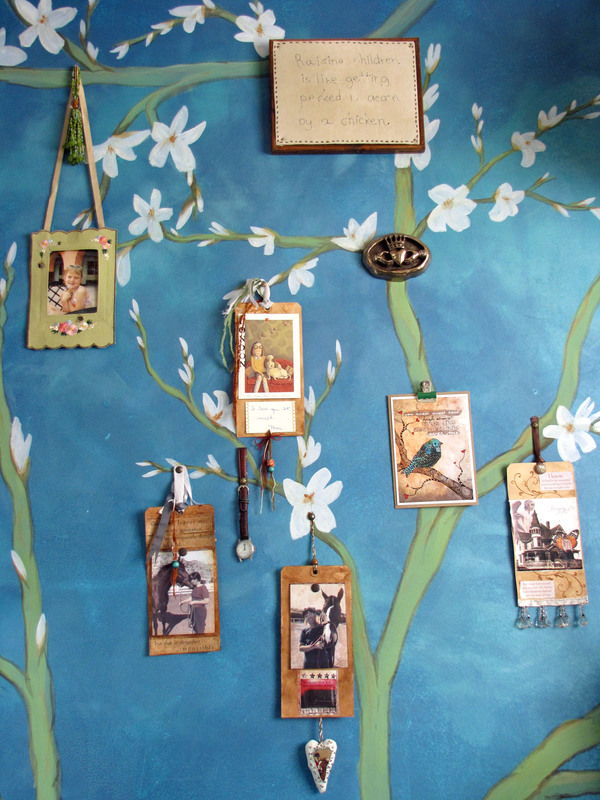 This is a close-up of the inspiration wall above the desk. 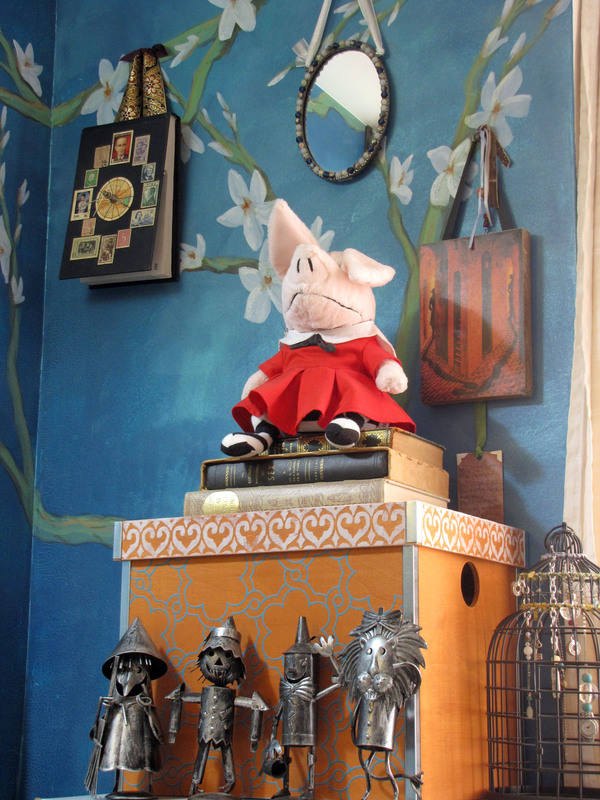 It’s mostly a collection of things that keep my late mother’s presence close to me. 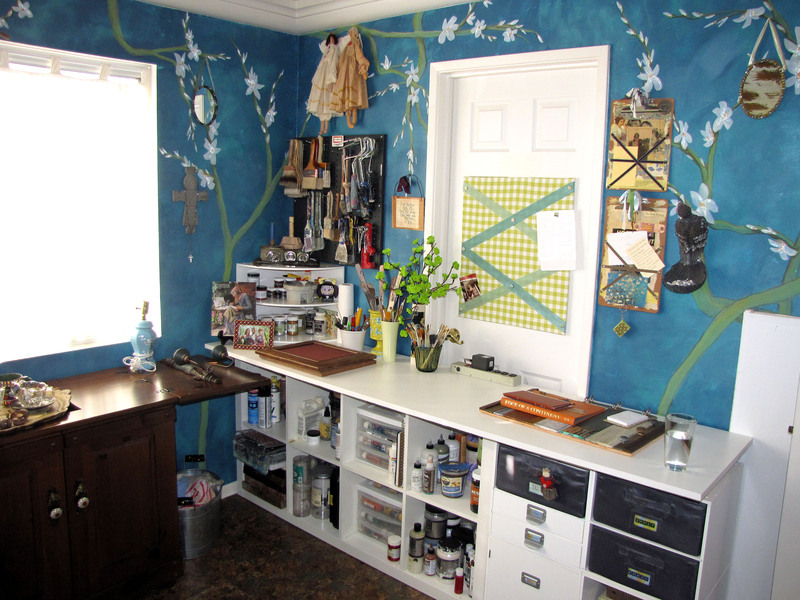 To the left of this desk I have a lot of places to hang supplies rather than cluttering up the desk with them. To the left of the hooks is my closet. 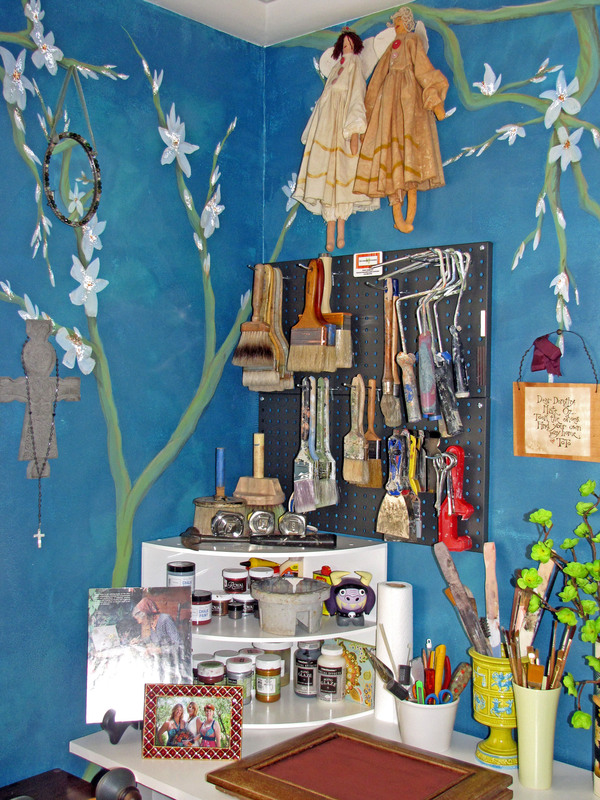 I decided to paint the inside of the closet to get rid of some product. I used Terra Cotta colored Setcoat from Faux Effects, followed by Golden’s Copper Metallic Medium. The metallic medium was great because it covered in one coat, which was important since I only had enough for one coat. I live on the edge! I pulled out a bookcase to use as a base for the new counter, so in it’s place I installed shelves that go all the way across. 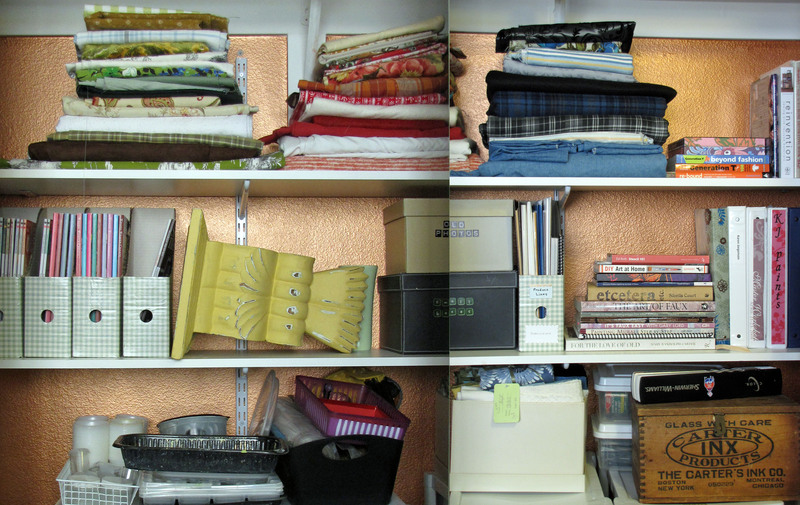 Since there are sliding doors on the closet I had to put two photos together to show you what it looks like, so forgive the splice line. I like having all my books and fabric inside the doors so that they’re safe from paint flinging. 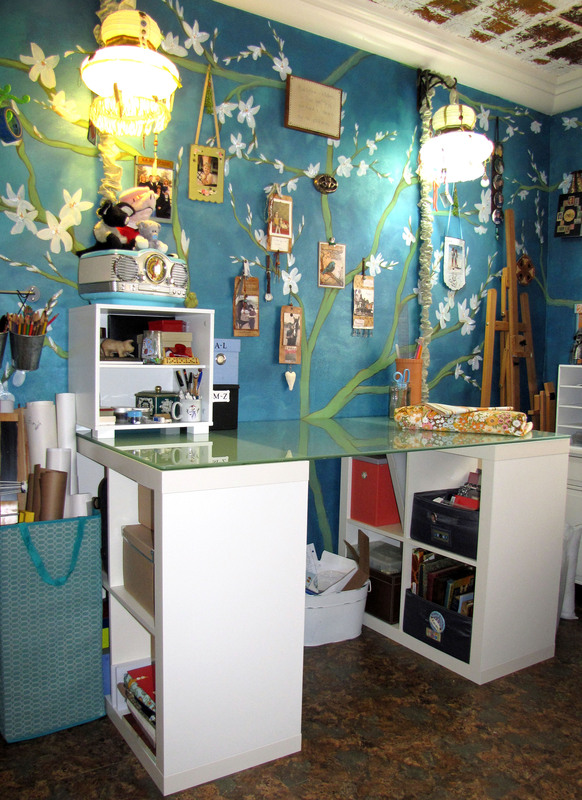 To the right of the mixed media station is a tower of storage pieces that hold all my office supplies. But most importantly, it holds up Olivia so she can keep track of all the goings on. So this is a before shot of the opposite side of the studio. This is where I kept dragging in a table and cramming it in among the flotsam in a desperate attempt to create a second workstation. My epiphany last week was that if I removed the bookcase I could put in a permanent countertop. Thus, the bookcase was removed. This photo makes me want to cry. Look at all that counter space! I dedicated this space to just painting. All my paints are underneath and all my tools are either hanging or on the counter. It’s so awesome. To the left of the new station is my sewing machine which hasn’t changed but I love that I can leave it open now that the bookcase is gone. More counter space! 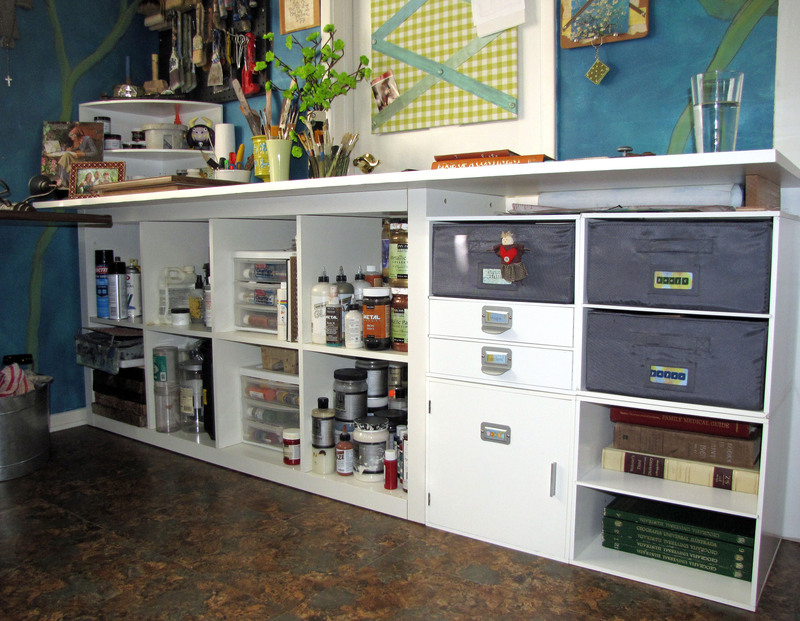 This base is made from a IKEA Expedit bookcase that used to be in the closet. I had it sitting vertically in the closet but realized that if I laid it on it’s side it would be desk height. Adding four craft cubes I already had made a base that’s over 7 feet long. All I bought was a $23 sheet of melamine covered particle board at Home Depot and had them cut it to fit my space. I also ironed on the melamine edge trim to cover the raw particle board where it was cut. It’s a very easy thing to do. Melamine is a great surface for me because very few things stick to it. This room actually connects to my daughter’s bathroom which is a Jack-and-Jill. I’ve never used the door because I always have something blocking it and because you never want to walk into a teenage girl’s bathroom…….ever. 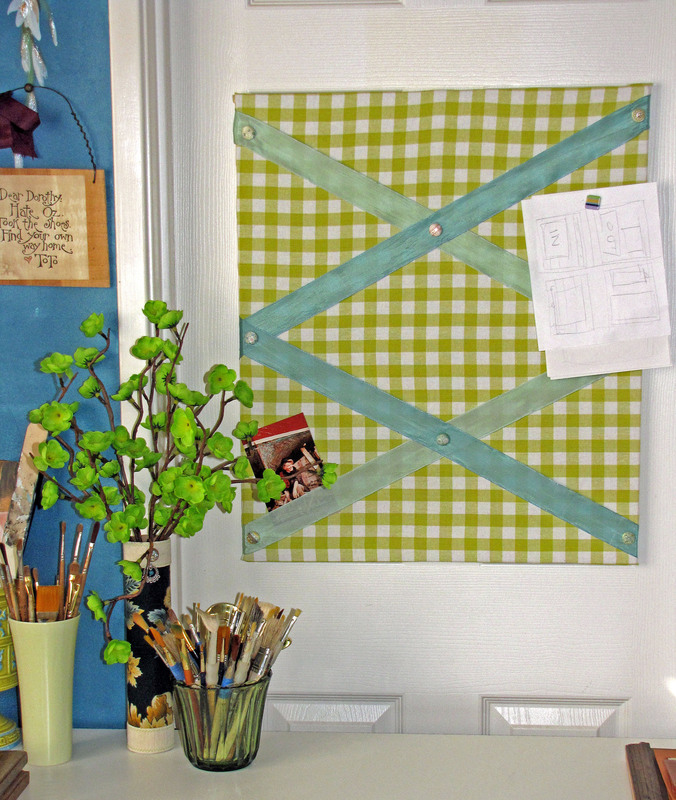 I decided to make use of it by creating a bulletin board out of cork, fabric and ribbon that I already had on hand. I love how it came out. My husband also added a power strip behind the counter so that I can plug things in without crawling through the base to get to an outlet. So smart. The final addition was this pegboard. I had these metal panels from when I used to sell at craft shows. Since I’m no longer travelling for work I decided to empty my toolbox and have everything hanging where I can reach it. It’s really handy and it’s good for the brushes to hang rather than getting disfigured by laying in a pile. So there you have it. I hope you enjoyed the tour. I’m already back at work and totally loving my new/old space. I can’t wait for Melanie to see it now. It’s still small, but I feel like it got much bigger.